A prerequisite for ordination in many Christian denominations, this professional degree combines vigorous academic studies with hands-on practice and reflection on ministry. 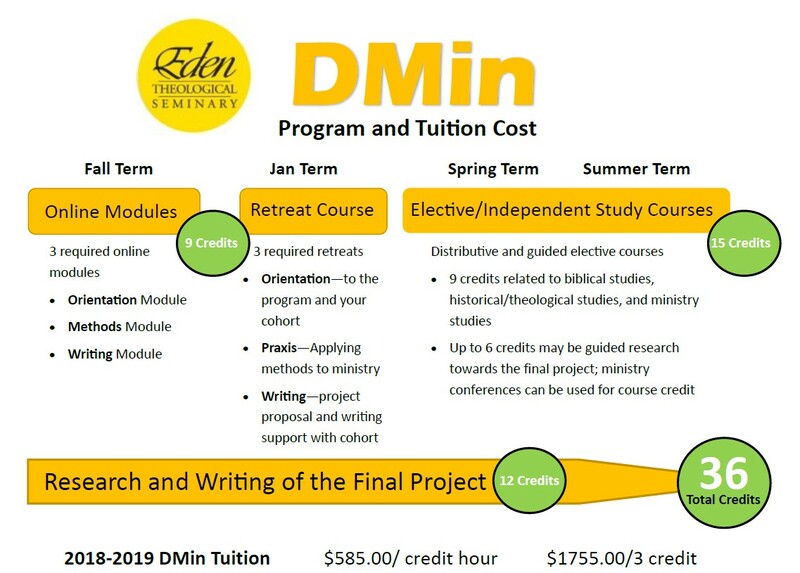 Students enrolled in this degree program should be exploring some form of ordained ministry within their personal denomination. Focused on theological reflection for the practice of ministry, this path is best suited for those who might serve as lay, diaconal, or recognized ministers in a specialized form of ministry. Designed for new college graduates who want to make a difference through a career in nonprofit management, public policy or civic engagement. It includes ethics, faith-based, and business management course-work along with an 12 month internship within a nonprofit. 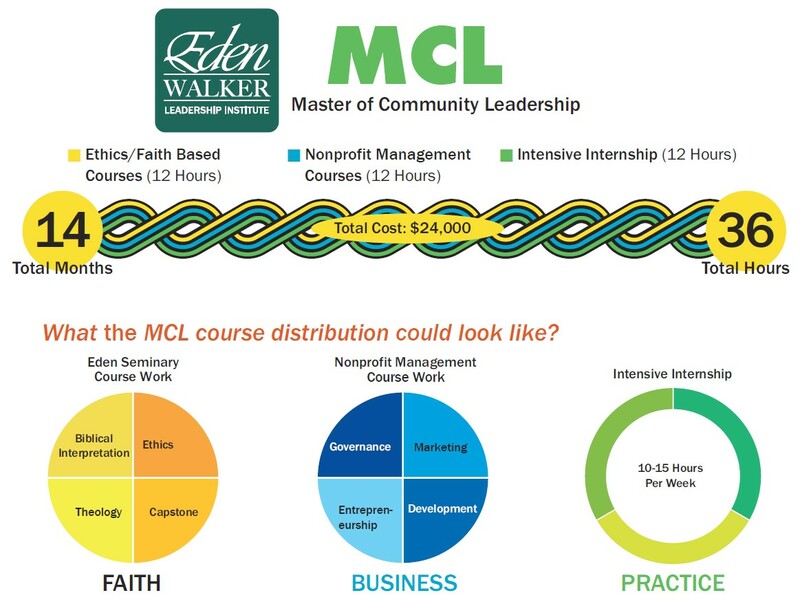 In addition to the MCL, graduates will receive a Graduate Certificate in Nonprofit Management from Webster University. Focused on the Biblical, historical, and theological foundations of the Christian faith, this degree path is suited towards careers in academia. Students focus on academic work and scholarly research under faculty direction. An advanced degree for those with at least three years of experience in ministry after receiving a Masters in Divinity. This doctoral program provides an opportunity for continued theological study and disciplined reflection on the practice of ministry. A degree path where students will earn both a Master of Divinity or Master of Arts in Professional Studies degree from Eden Theological Seminary and a Master of Social Work degree from the George Warren Brown School of Social Work at Washington University. Contact the Admissions department for more information about this program. To prepare students for some form of ordained ministry. A prerequisite for ordination in many Christian denominations, this professional degree combines vigorous academic studies with hands-on practice and reflection on ministry. 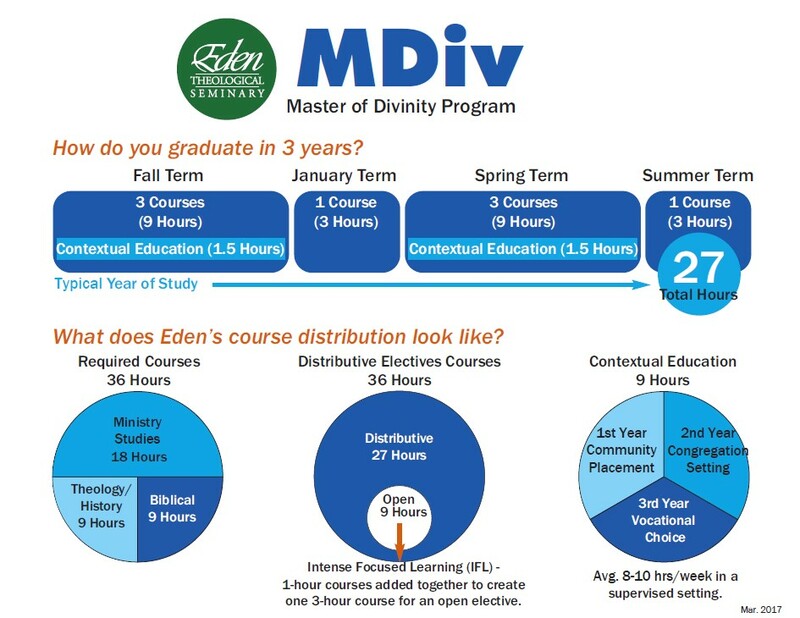 Learn more about the MDiv program by contacting us now. 314-918-2504 or [email protected]. To educate leaders for the church, particularly those who wish to serve as lay, diaconal, or specialized ministers. 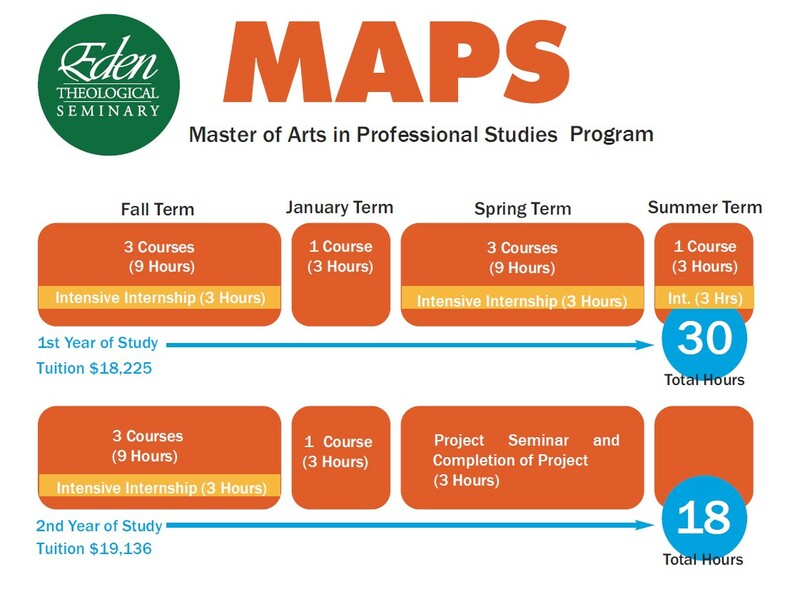 Learn more about the MAPS program by contacting us now. 314-918-2504 or [email protected]. Prepare students to begin a career in public or private sector enterprise, civic engagement, community organizing, and public policy and/or advocacy. Learn more about the MCL program by contacting us now. 314-918-2504 or [email protected]. Students focus on academic work and scholarly research under faculty direction. Focused on the Biblical, historical, and theological foundations of the Christian faith, this degree path is suited towards careers in academia. 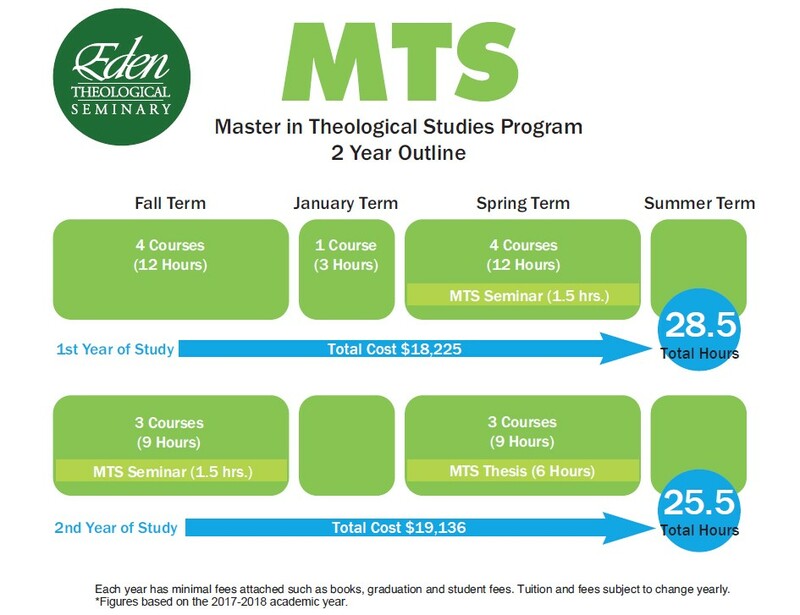 Learn more about the MTS program by contacting us now. 314-918-2504 or [email protected]. To provide an opportunity for continued theological study and disciplined reflection on the practice of ministry. This is an advanced degree for those with at least three years of experience in ministry after receiving a masters degree. Learn more about the DMin program by contacting us now. 314-918-2504 or [email protected].